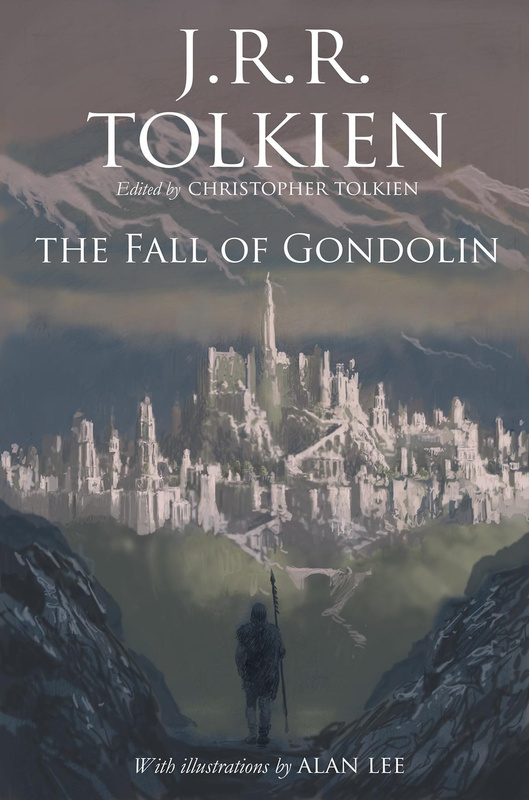 The Fall of Gondolin is Tolkien’s final posthumous publication and the third of his “Great Tales,” alongside The Children of Húrin and Beren and Lúthien. It was compiled and edited by his son and literary executor, Christopher Tolkien, and contains multiple versions of the story, accompanied by the younger Tolkien’s commentary and Alan Lee’s sublime illustrations, as well as a list of names and places, additional notes, genealogies, and a glossary. The centerpiece of the book consists of the original story and the final version, written thirty-five years apart. Christopher Tolkien compares the two in his accompanying essay. All of the material here appears in other collections of Tolkien’s writings (e.g., The Silmarillion, The History of Middle-earth), but grouping them together in one volume allows the reader to compare them more directly and see how the story evolved. Tolkien began writing The Fall of Gondolin in 1916, making it the first story belonging to the Middle-earth mythos that he ever wrote. Like the other “Great Tales,” it takes place during the First Age, about six thousand years before The Lord of the Rings. Its protagonist is Tuor, son of Huor and cousin of Túrin Turambar. He is visited by Ulmo, Vala of Waters and the “mightiest of all Valar next to Manwë,” who arises from the water amid a storm and instructs him to find Gondolin and tell Turgon, King of Gondolin, to prepare to battle Morgoth. He then embarks on his journey, guided by an Elf called Voronwë. When Turgon rejects this advice, Tuor tells him to lead the Gondothlim to safety in Valinor. But Turgon insists on remaining in Gondolin. Tuor marries Idril, Turgon’s daughter; their son is Eärendel (later known for his sea voyages and for being the father of Elrond). The hidden city of Gondolin was founded by Turgon and is located in Beleriand in Middle-earth. It is described as an idyllic city characterized by “fair houses and courts amid gardens of bright flowers” and “many towers of great slenderness and beauty builded of white marble.” Its inhabitants are Noldorin Elves, known for their skill in lore and crafts. They are similar to Europeans in appearance and are described elsewhere as having fair skin, grey/blue eyes, and brown, red, or silver hair. The Gondothlim are also known for their warlike prowess and are skilled archers. They were the only Noldor who did not fall to Morgoth (here called Melko/Melkor) after the catastrophic Battle of Unnumbered Tears. The location of their city remained unknown to Morgoth for nearly four centuries. Gondolin is ultimately betrayed by Turgon’s nephew, Meglin, after he is captured by Orcs. Fearing for his life, he offers to reveal Gondolin’s location to Morgoth and ends up assisting him in his plan to capture the city. Christopher Tolkien calls this “the most infamous treachery in the history of Middle-earth.” Interestingly, Meglin is described as having a swarthy complexion and is rumored to have some Orcish blood. Morgoth launches an attack on Gondolin with Balrogs, dragons, and Orcs. The ensuing battle is described at length in the earliest version of the story. The Gondothlim fight valiantly, but the battle is a decisive victory for Morgoth. The city goes up in flames, and Turgon is killed. Tuor, Idril, and Eärendel, along with other survivors – including the warrior Glorfindel (whose name means “golden-haired”) – escape through a secret tunnel and flee. They are ambushed by a Balrog and some Orcs. Glorfindel heroically battles the Balrog atop a precipice, perishing in the act. Thorondor (Lord of the Eagles) gives him a proper burial. Some were all iron so cunningly linked that they might flow like slow rivers of metal or coil themselves around and above all obstacles before them, and these were filled in their innermost depths with the grimmest of the Orcs with scimitars and spears; others of bronze and copper were given hearts and spirits of blazing fire, and they blasted all that stood before them with the terror of their snorting or trampled whatso escaped the ardour of their breath. The fall of Gondolin marked Morgoth’s triumph over Middle-earth. He was not defeated until Eärendel persuaded the Valar to unite against Morgoth during the War of Wrath, ushering in the Second Age. The essential story remains the same across each version presented here, though there are minor differences. The last version is most unlike the others. It depicts Tuor’s meeting with Ulmo and his journey with Voronwë in detail but stops abruptly upon his arrival at Gondolin. This is unfortunate, because it is the most well-written of the lot. The scenes depicting Ulmo’s appearance before Tuor (“clad in a gleaming coat, close-fitted as the mail of a mighty fish, and in a kirtle of deep green that flashed and flickered with sea-fire as he strode slowly toward the land”) and Tuor’s entrance through the seven gates of Gondolin are particularly striking. As the last Elvish stronghold amid a sea of Balrogs, Orcs, and other mutant creatures, Gondolin cannot help but bring to mind examples of white enclaves located in non-white countries – the Germans in Jamaica, the Poles in Haiti, the Confederates in Brazil, and so forth. None of these groups still exist. It is a very grim prognosis, but whites under such conditions are doomed to the same fate as Gondolin (albeit through the subtler means of miscegenation), and such conditions will eventually become the norm if present trends continue. 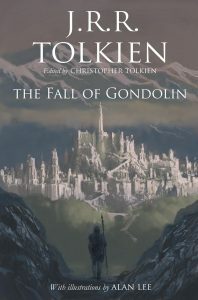 I recommend The Fall of Gondolin to all Tolkien fans. The commentary and notes shed light on the story, and it’s interesting to compare the different versions side-by-side. Christopher Tolkien writes that this is “indubitably the last” Tolkien publication. It is really the end of an era.